WASHINGTON — For the first time in three decades, Barbara Mikulski’s name will not appear on the ballot for Maryland’s U.S. Senate race. Instead, voters will be asked to choose between Maryland Del. Kathy Szeliga, U.S. Rep. Chris Van Hollen or Green Party candidate Margaret Flowers to represent them in the Senate, and fill Mikulski’s trailblazing shoes, when they head to the polls on Tuesday. The senator, known as the “little general in pearls” and the longest-serving female senator, announced last year that she would not seek a sixth term and would retire. Voters will also choose their member of the U.S. House, in addition to making their pick for president. Here’s a look at some of the key matchups in Maryland’s D.C. suburbs. 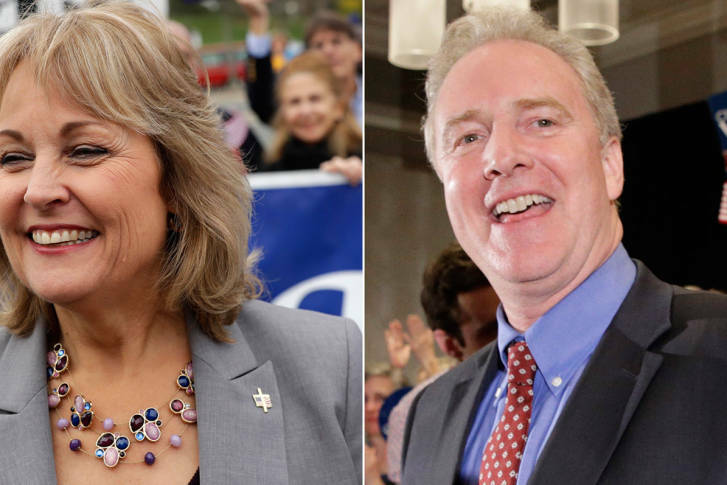 Van Hollen, a Democrat from Kensington, was the victor of a bruising primary race that included nine opponents, including his House colleague Rep. Donna Edwards. Szeliga, of Perry Hill in Baltimore County, beat 13 other candidates in the Republican primary for the chance to take Mikulski’s place. Szeliga has served in the Maryland House of Delegates for six years and is the minority whip. She works for her family’s construction business. But in a state where Democrats outnumber Republicans 2 to 1, Szeliga faces an uphill battle against the seven-term congressman. Despite that advantage, Van Hollen’s campaign has poured $5.7 million into the race since July. Szeliga’s team has spent almost $700,000 in comparison during that same time frame, according to federal campaign finance records. Szeliga has painted Van Hollen as a Washington insider and career politician who has failed to bring about the changes that Marylanders want. She has said she’ll be an independent voice. Van Hollen has criticized his opponent for her support of Donald Trump and for not supporting Hillary Clinton’s historic candidacy. He said he’d fight for all Marylanders, like Mikulski did. Both Szeliga and Van Hollen want to see more competition for insurance offered through the health care exchanges. Van Hollen said a public insurance option should be available to offer that competition. Szeliga said the nation’s health care system can’t be fixed without reforming tort laws. Szeliga wants high schools to once again provide vocational training for students who’d like to become plumbers or electricians. She argues that delaying career training until after high school costs students more because they must pay to attend community colleges. She said a college education, while important, isn’t for every student. Van Hollen said that a quality education, from kindergarten through high school, is necessary to grow the economy and support a strong middle class. He wants to connect students with employers and ensure that students are prepared for employment opportunities in the modern workforce, such as cybersecurity jobs. He would allow students to refinance their student loans to take advantage of lower interest rates. Szeliga said universities should better use technology to save students money. She would allow student loans to be repaid through home mortgages. Both candidates agree that Marylanders shouldn’t be jailed for drug addictions. Van Hollen wants to focus on addiction treatment; Szeliga said she would “empower” local law enforcement and recovery centers to address the heroin epidemic. Van Hollen called the Simpson-Bowles plan a solid framework to begin addressing the debt. He said he would remove the tax breaks and loopholes and allow Medicare to negotiate prices with drugmakers. Szeliga said one of the main reasons she is running is to help curb and pay down the national debt. She said Washington needs a long-term plan to reduce the debt. The first step she said is for lawmakers to admit they have a spending problem. Szeliga said she’d like to work to reform the Department of Veterans Affairs; Van Hollen would work on infrastructure legislation to modernize the nation’s transportation and broadband networks. Former Lt. Gov. Anthony Brown is hoping to seal his political comeback with a general election victory in Maryland’s 4th Congressional District race. Brown is running to fill the seat vacated by Donna Edwards, who lost her primary bid for U.S. Senate in the spring. Brown won a three-way battle for the Democratic nomination, giving new life to his political ambitions after a stinging loss to Republican Larry Hogan in the 2014 governor’s race. He faces small businessman George McDermott, a Republican who has run for Congress multiple times previously. Rep. John Delaney has spent more than $627,000 since July to ward off Republican challenger Amie Hoeber, who has spent nearly $400,000 on her campaign to unseat the two-term congressman. Hoeber, of Potomac, served as a deputy secretary of the Army during the Reagan administration and now runs her own consulting firm, which specializes in defense, national security and environmental cleanup. Delaney founded and led the investment bank CapitalSource before heading to Congress. The 6th District includes western Montgomery County, the City of Frederick and all of Western Maryland. State Sen. Jamie Raskin is seeking his first term representing Maryland’s 8th District, which includes portions of Montgomery and Carroll counties and most of Frederick County. The Democrat and constitutional law professor at American University faces Republican Dan Cox, a lawyer from Frederick County. Libertarian Jasen Wunder and Green Party candidate Nancy Wallace are also running. Raskin beat out multiple opponents in the Democratic primary — the most expensive primary in the nation this year — for the chance to succeed Van Hollen, who currently holds the seat. To see the list of candidates in Maryland’s other districts, visit the state’s official election website. Today is the last day to cast an early ballot in Maryland. Early voting centers are open from 8 a.m. to 8 p.m. Thursday. Learn more about Maryland’s early voting here. The deadline to request a mailed or faxed absentee ballot has passed. However voters can still request to receive their absentee ballot electronically and can submit their request through Friday. Completed absentee ballots must be postmarked by or returned to the local board of elections by Nov. 8. Learn more about requesting an absentee ballot here. On Tuesday, the polls open at 7 a.m. and close at 8 p.m.